ESCAP supports governments in Asia-Pacific in implementing measures to efficiently involve the private sector in infrastructure development. Developing case studies is part of this effort and promotes exchange of experience among the countries of the region. 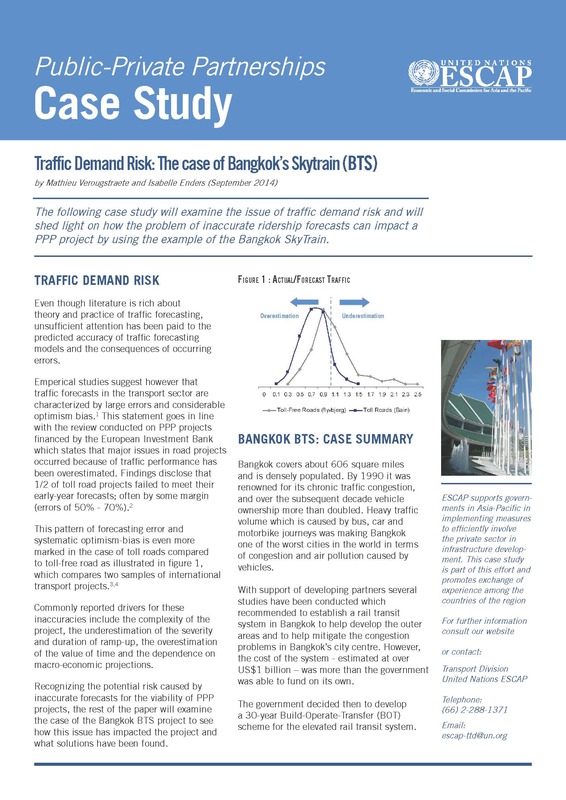 The following case study examines the issue of traffic demand risk and sheds light on how the problem of inaccurate ridership forecasts can impact a PPP project by using the example of the Bangkok SkyTrain. This case study considers the question of whether efficiency gains can be achieved by introducing private operators in sectors traditionally managed by public entities. This case study reviews the development of highways in India and shows the possible shift in infrastructure financing from traditional public procurement to a Public-Private Partnership (PPP) model within a relatively short period, as well as the challenges encountered. This case study clarifies how property development programme has been used to finance Hong Kong’s public transport system and whether this model is replicable in other countries. The Malaysian government has improved the capacity and efficiency of its port infrastructure by involving the private sector. This case study reviews the development of the largest port in the country, Port Klang, and considers the role of the public partner when ports are privately operated.